FocusTrack, the production lighting documentation system, and SpotTrack, its companion program for recording followspot cues, have had a long involvement with the hit musical Billy Elliot in London, Australia, New York and on tour around the USA. Now that involvement is continuing with the new, faster-moving US 'tour 3' of the show. Designed once again by Rick Fisher, working with associate LDs Dan Walker and Kristina Kloss, the new tour has downsized the rig in order to allow it to be set-up more quickly on that road while retaining the overall look that won Fisher a Tony Award for his work on the show in New York. 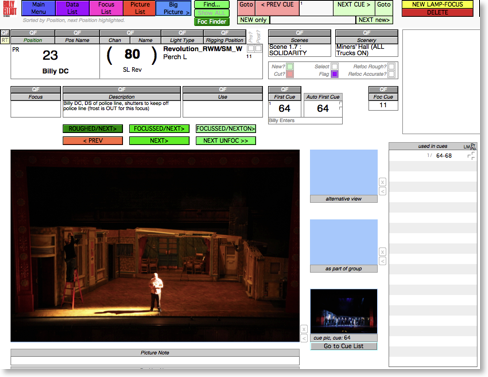 The adaptation to the new rig used FocusTrack as the reference point to previous productions: the software held a photographic record of every focus of every lamp in the show, and also every individual cue in the show. This information could instantly be accessed by fixture, by fixture type, by rigging position, or even by cue, with the software then displaying both the individual lamp-focus and how that lamp-focus was actually used in a cue. This allowed the lighting team to make clear, informed decisions about how to best utilise the equipment available in the new rig to re-create the look of the show. Once the adaptation was complete, FocusTrack was deployed once again to precisely document the new lighting, ensuring that the touring crew had a complete, accurate record of what they had to re-create at each stop on the road. FocusTrack imported the showfile data from the show's ETC Eos lighting console and automatically figured out which lights were used in which focuses in which cues. The updated focus plot was then created quickly and efficiently by having FocusTrack control the console console to bring up each light in each position in turn, then trigger a digital camera to record that focus. FocusTrack can also show which colours and gobos are actually used in the show, minimising replacement costs as the tour continues or on future productions. 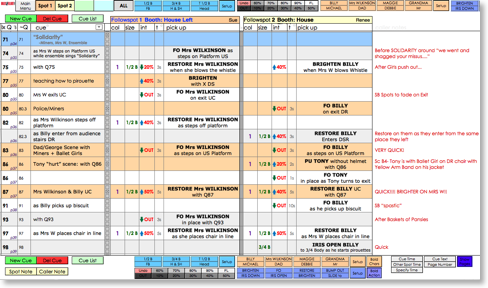 The new tour also continued to use SpotTrack to manage the show's two front spots, providing a quick way of creating, editing and printing follow-spot cue sheets while also collecting together information invaluable for new spot ops as they have to learn the show, including the followspot set-up, cast pictures and more. Further information about Billy Elliot's current US tour, currently booking through 2013, can be found at www.billyelliottour.com. Billy Elliot is just one of the many shows to use FocusTrack and SpotTrack, recent appearances on Broadway including Anything Goes, Bonnie and Clyde, Evita, Follies, Hugh Jackman - Back on Broadway, Mary Poppins, Porgy and Bess, Rent, Sister Act and the Radio City Christmas Spectacular, and in the UK including the tour of Sister Act and the new touring production of The Phantom of the Opera, as well as at companies including Cirque du Soleil, the National Theatre and English National Opera. Further information about FocusTrack can be found elsewhere on this website; further information about SpotTrack can be found at www.SpotTrack.co.uk. FocusTrack's Rob Halliday is currently in New York; anyone wishing to arrange a demonstration of the software can contact him here.